‘The Polar Bear and the Snow Cloud’ is a simple but endearing story about a little polar bear and his search for a friend. It is written and illustrated by Jane Cabrera, who I had not heard of before, but I was quite impressed by this and will definitely look out for more of her children’s stories. 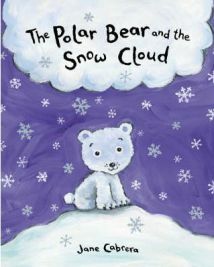 At the beginning of the story we meet the little polar bear who we discover has no friends apart from one snow cloud! The polar bear is quite happy to be friends with the snow cloud and is very fond of him, but also wishes that he could have the sort of friend that he could actually play with. The snow cloud never actually seems to do very much! The snow cloud, feeling sorry for the polar bear, decides to help and he creates a number of different friends, by dropping snowflakes to form- first an owl, then a whale, then a seal and finally a reindeer! The polar bear is initially excited by the thought of his new friends, but is soon disappointed when he realises that they can’t actually do much. And then, most disappointingly of all, each melts away! After having gone through all of this disappointment, the next day he sees another polar bear. Of course, by now he doesn’t expect much, and fully expects that this one will melt away too! However, an extraordinary thing happens…when a snowflake falls on the other polar bear’s nose he sneezes very LOUDLY! This polar bear was not made by the snow cloud and can play many games which means that they have a fantastic time together. So in the end the polar bear is very happy! This is, in essence, a simple story, but one that gets children thinking about friendships, and the things that they like to do with their friends. The story is also accompanied by some wonderful illustrations – very clear and bold with beautiful colours- these all help to support the storyline. I particularly noticed this, when after reading the story to one of my daughters at quite a young age; she told me that she then wanted to read it to me! (She was not yet three and a half so had not quite mastered the art of reading!) She was able to tell me the story in the order that it happened, partly because there is repetition within the story with each of the ‘friends’ melting away, but also because she was able to use the pictures so well! I always think that good picture books enable you to do this! The Polar Bear and the Snow Cloud is a beautiful book with a simple but effective storyline that I am sure that both children and adults will love as they read it together. No Comments on "The Polar Bear and the Snow Cloud"